If you asked my three kids what their favorite food was when they lived at home, they would all say, "enchiladas." I know this because I asked, but I kind of knew it anyway. It was the food always requested for birthday dinners or other special events. The version I made was based on a recipe in an old copy of "The Farm Cookbook" I'd found at a garage sale. Making this dish was a big production for someone who mostly cooked on the fly and used cookbooks for inspiration, not recipes. It involved cooking beans, making cheese sauce and chili gravy, and then assembling the whole thing and baking it. One of the kids didn't like corn tortillas so I used whole wheat, and sometimes I made the tortillas, too. So many pots and pans and bowls and baking dishes. At some point I started using Fantastic instant refried beans for the filling, but the whole process was still labor intensive. I must say, though, that those enchiladas were really good! Recently, after I'd revisited the cheese sauce from "Uncheese Cookbook," I got to thinking about those enchiladas and told my husband that I really wanted some. What do you know - he surprised me with a huge pan of them, and after stuffing myself at dinner and two lunches, I'm sated. No more enchiladas for a while for me. He didn't make the same ones I used to cook. 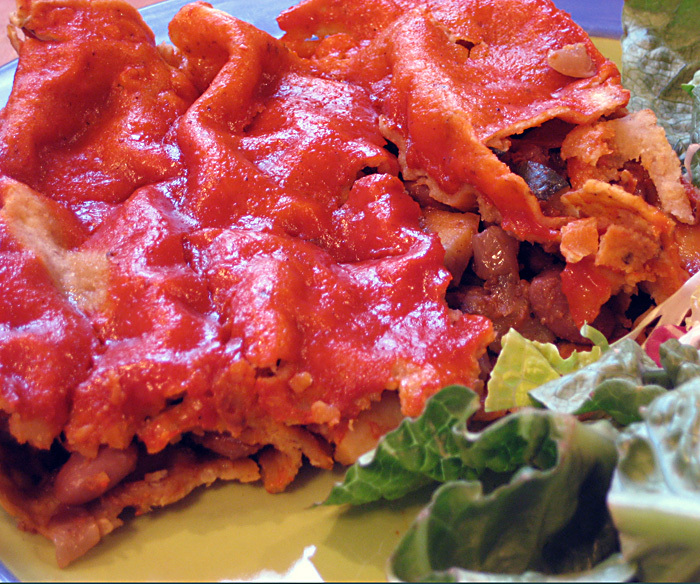 He watched a video of someone cooking a simpler version of enchiladas and adapted the recipe. He used canned beans, fresh potatoes and zucchini, canned enchilada sauce, packaged corn tortillas and no cheese, and the end result was really good. It was a bit too salty for me (all those cans of things) so I've reduced the added salt in the recipe. I've also added some green chilies. Sauté the onions and potatoes in the oil in a heavy skillet or wok until the onions are transparent and the potatoes begin to soften. Season with salt and oregano near the end of cooking. In a large bowl, combine the cooked mixture, beans, zucchini, olives and chilies. Mix well and taste for seasoning. Cover the rolled tortillas with the remaining sauce. Cover the dish with aluminum foil and bake in a preheated 350˚ oven for 45 to 50 minutes. Serve with green salad and avocados. note: When I had this for lunch the second time, I added a little vegan mozzarella on top. As an alternative to canned sauce, you could make chili gravy. It's the Tex Mex version. Fry onions in oil until soft but not brown. Mix in everything but water. Slowly whisk in water to keep from lumping. Bring to boil and cook for 20 minutes at slow boil. Use instead of enchilada sauce. There will be leftover sauce for another recipe.